The ultimate visual stunner from a top-notch custom drum builder. Seven colours and 25 different patterns, strobes and effects, easy operation and superb tone. Won't be to everyone's taste. 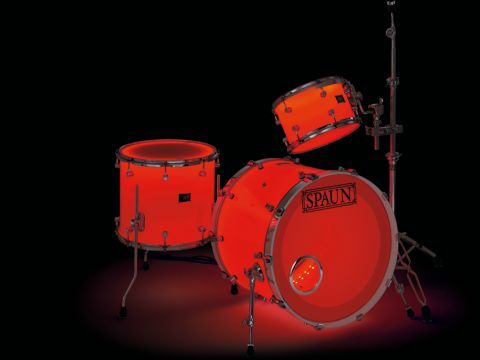 The Spaun Drum company of LA is a custom-build outfit, started by drummers Brian Spaun and David Pimentel in 1996. From the off, Spaun drums were visually stunning with their custom paint jobs. Now Spaun has gone further with this Acrylic Custom kit, fitted with a full LED light system, plus wireless controller and flight-cased control module. "This kit sounds not so much glassily brilliant as deep and mellow, warm and dense." Spaun's rectangular badge states 'precision crafted in the USA', and that is a fair description. Everything the company does is neat and tidy, cleanly finished and accurately aligned. Like many American companies Spaun buys in its blank shells - and in this case won't divulge its source. The shells are ¼"-thick acrylic with a single glued join and narrow joining strip, visible on the inside - similar to Ludwig's recent Vistalite construction. The first thing Spaun does with its blank shells is to give them equal-sided twin 45° bearing edges, a company trademark. Rising to a peak in the middle, this profile has the advantage of engaging the flat of the head, not the collar, giving pinpoint definition and tuning. Another Spaun trademark is the gorgeous little single-point mount SBR (Solid Brass Resonator) lug. It's a two-part design with the rounded body turned from solid brass (no cavities), while the separate insert 'floats' so that it aligns easily and won't cross thread with your bolts. Review kit sizes are 22"x18", 12"x8" and 16"x14". The small tom is held aloft by Spaun's classic SSS (Spaun Suspension System) isolation holder, while the floor tom has stocky 7.5mm gauge legs. Tom hoops are 2.3mm triple-flanged chromed steel and the bass drum hoops are wood with a strip of chrome wrap to match. Now what about that stunning Sandblasted White finish? Shells are actually clear acrylic with sandblasted interiors which give a frosted look. With the lights turned off the finish is milky white and is ultra-smooth, a surface you will need to look after carefully; we reckon it could scratch quite easily. Recommended alternatives are Translucent White or Smoky Acrylic with black hardware. Clear shells are not advised because they would reveal the interior fixings, the LEDs and wiring. You could choose a coloured acrylic (from a massive palette), but this would rather defeat the purpose. As company boss Brian Spaun explains, "Coloured shells will alter the base colour of the LEDs. If you set the LEDs to red and have a blue shell, it's going to be a combination of those colours - probably some variation of purple. "If you want the true colour of the LEDs, white or sandblasted shells are best. Smoke shells maintain the true colour pretty well, they just make it darker." Of course, the lights are the big selling point. Fixed along the inner perimeter of each drum is a strip of tiny LEDs that are wired up to an XLR socket mounted on each shell exterior. Spaun provides a 10ft-long cable for each drum and these are connected to the controller box, which is a stand-alone 19" one-unit rack. The rack is housed in a flight case made by SKB of California and is lightweight but strong. The controller has eight outputs so there's plenty of room to expand your kit. In fact Spaun can extend beyond eight, but suggests eight is as big as most kits get these days. Incidentally, the unit has an adaptor for use with USA or UK/European power supplies, so you shouldn't have any problems with international touring. Inside the box is a master controller and wireless receiver programmed to take instructions from a lightweight hand-held (RF) radio frequency program selector. This is a palm-sized plastic device with eight buttons. Using this you can quickly access a surprising diversity of colours and lighting effects. Sound-wise, you either like the acrylic tone or not; whenever we've tested one we've been pleasantly surprised. The glassy, synthetic look of the milky plastic inevitably suggests a less than organic, colourless sound. And yet this kit sounds not so much glassily brilliant as deep and mellow, warm and dense. The timbre may not be so complex as wood, the sustain not so prolonged, but the drums are easy to tune, control and mic up. Acrylic is as hard/dense as wood and the 45° pointed edges focus the sound and help sharpen the definition. Together with the warming effect of the coated twin-ply Evans G2 batter heads, the overall sound is thick with a prominent leading edge thwack from out front. The classic-sized 12"x8" tom has the sort of depth you'd get from a 12"x9" or 12"x10" in maple, and the 16"x14" floor is more like a 16"x16". We've noticed before that this characteristic depth of tone makes for a dark-sounding bass drum, but the three drums together have a level consistency that's sometimes missing from wood drums. On to the lighting: the hand-held RF controller can be operated from behind the kit by the drummer or, since Spaun says its range is at least 150ft, there's plenty of scope for off-stage control by anyone - roadie, tech or lighting guy. The controller is lightweight, doesn't feel overly sturdy and will need careful looking-after on the road. Button 1 controls on/off, while button 2 is play/pause. The three other pairs of up-down buttons control the speed of change (faster or slower), brightness (brighter or duller) and the number of patterns. Individual colours are red, blue, purple, green, yellow, cyan or white, and they can be selected for static running or stroboflashing at varying speeds. Pattern-wise you can have three- or seven-colour 'jumpy' or three- or seven-colour gradually changing. Then there are various dual colour cross-fades and random flashing. In all there are 25 alternative effects, which is pretty impressive, and you really do have to see them. The kit's a light show all unto itself - never has the drummer stolen the show so easily. For drummers working with digital/computerised light shows, Spaun can upgrade your system with Global (Digital Multiplex) DMX or Independent DMX capability, enabling the lighting guy to program more complex effects, in which case the RF handset becomes obsolete. Global DMX means all drums change colour together, while Independent DMX means each drum can change independently from the next.